The federal government implemented the Registered Disability Savings Plan on December 1, 2008. The RDSP is a savings plan designed specifically for people with disabilities in Canada. 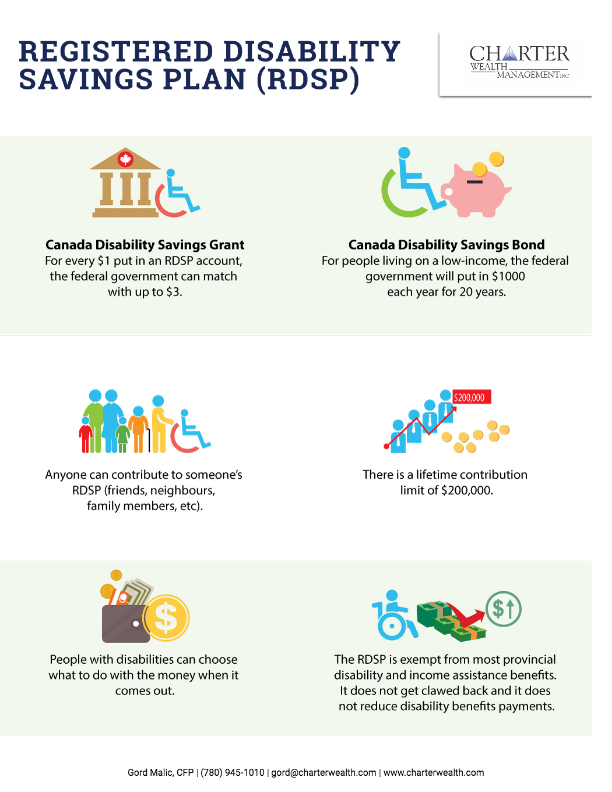 Canada Disability Savings Grant: For every $1 put in an RDSP account, the federal government can (if your family income is below $87,123) match with up to $3. Canada Disability Savings Bond: For people living on a low-income, the federal government will put in $1,000 each year for 20 years. Anyone can contribute to someone’s RDSP (friends, neighbours, family members, etc). There is a lifetime contribution limit of $200,000. People with disabilities can choose what to do with the money when it comes out. The RDSP is exempt from most provincial disability and income assistance benefits. It does not get clawed back and it does not reduce disability benefits payments. The RDSP can be complicated, please talk to us for a complimentary review.